If you’ve stepped into our office at any time over the last 7 months, you’ve probably notices our massive “live life without limits” sign proudly displayed in our reception area. This phrase seems to capture how as a chiropractor we want to help you however, it is also a reflection of how I want to live my life too. Almost 12 months ago I had to submit an application to even enter the race. I still remember the butterflies fluttering the day I was accepted. Then the reality kicked in. 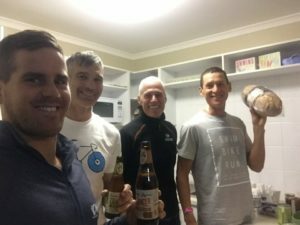 How to prepare for the 10ks of swimming, 420ks of riding and a 84.3k run? It is a question I’d certainly never answered before, let alone while still remaining happily married, an engaged father and a business owner. It was a question though I was keen to answer. So in preparing to tackle this beast I partnered with the major research body behind chiropractic, Australian Spinal Research Foundation, in the hope that I could provide and inspire possibility to others throughout my journey. 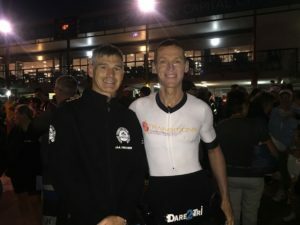 I also teamed up with the Endurance Doc, Bernard, who helped me balance the training and lifestyle load. 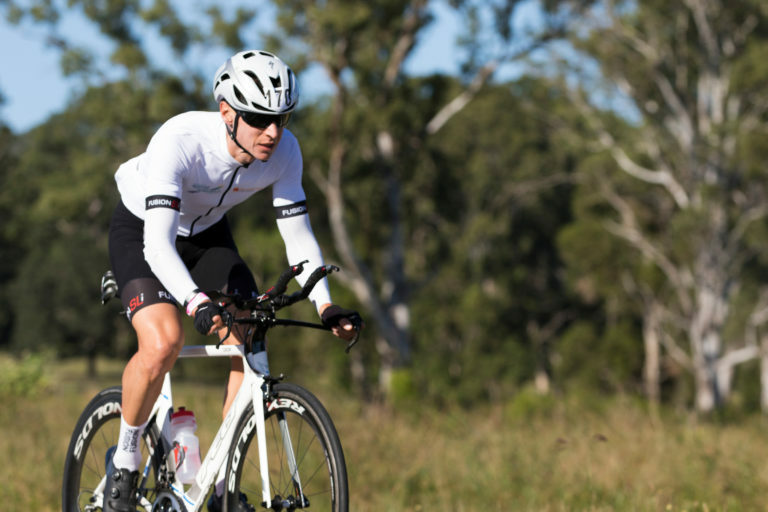 This style of race requires you to supply your own support crew. 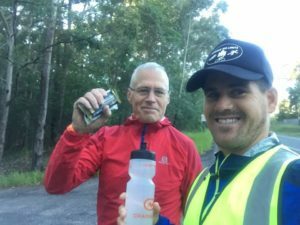 Thankfully Newcastle has a plethora of endurance junkies, so with the help of Chris from Newcastle Flyers and Benn & Will from Newcastle Tri Club, we were good to go. “Every mountain top is within reach if you just keep climbing” so in the lead up to the event, Bernard and I decided to focus more on the climb rather than the mountain top itself. Most of the training was based on building a big diesel engine. It wasn’t unusual for me to ride around 500km, run 80km and swim about 14km in a week. Thankfully Newcastle is a beautiful city to spend time outdoors and was easily able to tick off the distance with over 100k’s each week coming on the bike just by commuting to work. All this volume combined with regular chiropractic adjustments, massage and a truckload of fresh/real food, I managed to stay injury free leading up to the race. Arriving in Noosa 2 nights before the race gave us time to do all the necessary race registrations and even drive the 1st days bike course. We also had the ability to supply all my own race day food and the apartment we were staying at was fully self contained meaning we weren’t forced to eat out every night- a huge win. One of the hardest things was trying to get to sleep: tossing and turning, midnight bathroom stops and early alarms, was a hallmark of Noosa. However, all said and done, come race morning the best and only choice is Carpe Diem. Race day 1 started with a beautiful 10k swim. A beautiful Noosa sunrise greeted the 49 eager athletes waiting on Noosa beach. A small group of swimmers, each with our own support paddler as guides, too off on a two lap course. Swimming is definitely my weakest leg and combined with nerves it saw me exiting the swim comfortably, but way back in 30th position. At least now it was time for me to have a little “fun” and enjoy a 146k, hilly out and back ride. Seriously I loved this day - a genuinely tough ride with a couple of climbs closing on 20% gradient, a solid headwind on the way out meant for a tailwind assisted fly home. My crew passed me an iced coffee at the bike turn around and it’s just a magic thing to have on the bike. Living up to our work motto I wanted to live life without limits. I rode hard all the way home and finished day 1 in 14th position overall. Recovery consisted of hydration, food, massage, more food, more hydration, recovery pumps and attempted sleep. ​Day 2 was the furthest day on the bike if ever gone - 274k. 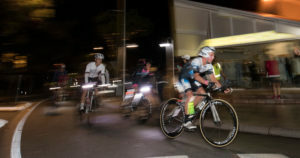 We rode out in a peloton leaving Noosa at 5:30am, so the first 60k was in the dark and without the support of my crew. After that my crew could be anywhere on the course to give me food and nutrition. Not only is this a godsend, every other athlete has their crew out there too. So especially from the 60km to the 170km mark even though they are long lonely roads, there was a traveling grandstand going around the course. When I finally got a flat tyre around 100k’s into the race, it was another crew which helped me change the tyre. Emotionally this was going to be a tough day as I was riding into Kenilworth- less than two years ago I came here to tackle the Hells Bells Adventure race and ended up in Nambour Hospital. ​This time around however, I flew past Kenilworth and not only did my crew pass me my second iced coffee, they also gave me a fluro pink “ultraman donut” and they called Merissa to let her know that I was still upright… I’m sure I could have been more focused on the race trying to catch the next rider in front of me, but here my head was firmly focused on the number one love in my life. Hitting the final 50k’s of day 2 the road started to flatten out, the surface was smooth and as I rode through Twin Waters Resort in Maroochydore and headed North back to Noosa, the incessant hills were replaced with roundabouts, cars, traffic, lights and even more roundabouts. A big difference between day 1 and 2 on the bike was the course knowledge. There was so much of day 2 I hadn’t seen before so I struggled to know when to go hard, when to back off, etc. So in retrospect, I held myself back and was more apprehensive leading into hills, corners and decent because I was never really sure what was on the other side and where the next turn marker would be. Although the road was quick and I felt I was flying up the coast, stopping 3 times at traffic lights wasn’t the whirlwind ride to the end I was expecting. Either way, I was still stoked to cross the line in 7th place for the day and still in 10th place overall. Starting Day 3 in 10th place overall! The recovery was more or less a mirror of the previous day: food, massage, hydration, food recovery pumps and attempted sleep. After day 1 I had a mid afternoon “nana nap,” given how brutally I slept that night, I ditched that for day 2 hoping I was going to have a better night’s sleep. By now, with two days in the bag and knowing that all I had to do was run, the mind started to relax. With running all it is is left foot, right foot. There can’t be any mechanicals and the hardest thing to do is to just keep going. I’d never ran 84km before and in training the longest I’d ran for was 5 hours (about 55km). Throughout my training we had worked on the program of running for 9′ then walking for 1′. Knowing the run was always going to be a war of attrition, I wanted to make sure I was still running at the end and not forced to walk. So this way, the walking was deliberate, planned and this would give my body and mind a break while providing an opportunity to reboot and refuel. So once again, kicking off at 5:30am meant we started in the dark. There were some other athletes also doing run/walk thing, but I believe that I had the shortest interval meaning I had a bunch of people ask if I was ok when I was walking less than 2km into a 84km day. I wasn’t running according to heart rate or speed- I was just running on perceived effort and trying to hold a pace I thought would get me to the end. The beauty of an Ultraman run is that your crew can support and run alongside you on the run leg. Captain Benn ended up running about 30km throughout the race, Chris did 20km, Will did 12km and Jared joined me for a 5-8km trot, so it was fantastic to have their support and company. ​Not only did it provide someone to talk to, they good the lead for directions, holding food & water and just keeping me on track. I got through the marathon point at 42km in 3:52 and my first thought was this is almost 20′ quicker than my last Ironman run in Wanaka only 3 months ago. We were all the way back at Twin Waters in Maroochydoore now, so all we had to do was run around and follow the signs till we hit Noosa Beach. It was also about here the wheels fell off a little. The pace went from 5:20/km to 5:30/km and nutrition was harder to get down. The dead flat roads and the monotony of running the same road twice and already having ridden it the previous day, meant I was stoked to finally reach Coolum Hill. On the other side of this I knew I was 28km from home. The next marker was with 21km to go and by now I could almost smell home. The pace dropped to 5:40/km over the next bit and it was a big mental battle to keep trucking through to the 10km point. At this stage, I’d said to Benn lets break 8hrs. Jogging past a school around 7km to go, with construction workers out the front I had to ask nicely if I could use their portaloo. An absolute godsend however, in the process I lost 2 places. Then I realised I got this and said to Benn, “I’m not stopping.” Running the final 7km felt like bliss- I could swear I was running 4:30/km, but the watch didn’t lie as I averaged 5:31/km of that final stretch. 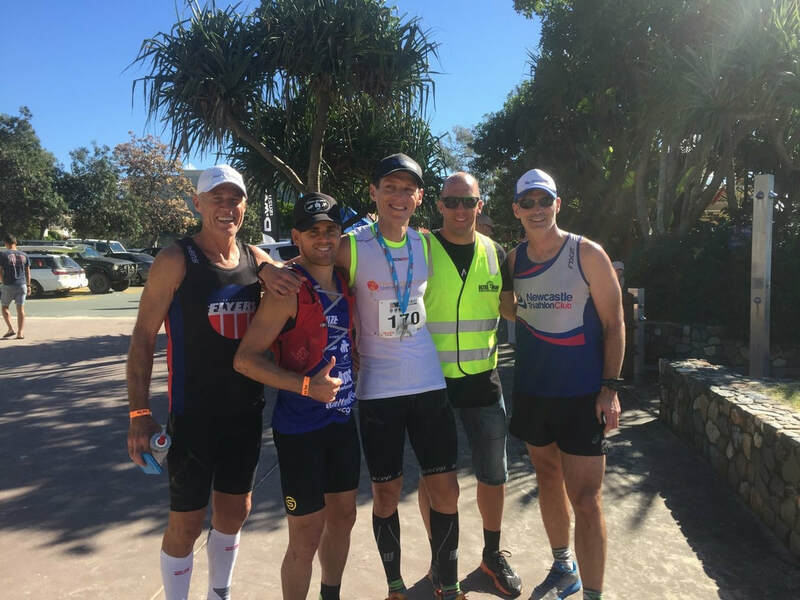 I was able to overtake both of the runners in front of me and was happy to turn onto the sand of Noosa Beach with Benn, Will and Chris all surrounding me and just like they had done all weekend, they supported me all the way to the finish. 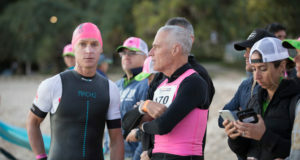 Benn kept a firm eye on the time making sure that the 8 hours wasn’t going to slip away, while Chris kept his eye on the beach behind so I could enjoy the final few hundred metres. Crossing the finish line was like nothing I’ve ever done before. It literally redefined what I thought was possible. I’d finished the day in 10th place resulting in me finishing in 9th place overall in a combined time of 24:18. Almost a full week later, I am still waiting for the post race high. Having my mates there supporting me the whole way and even my Uncle and Aunt being able to watch me cross the line was huge. Likewise, being able to raise over $1000 for the Australian Spinal Research Foundation was something I wasn’t even sure was possible. However, I think the reality of the situation is that I was (and probably still am) spent. I’ve got nothing left in the tank. All the matches are burnt and in the past as soon as I’ve finished a race I can’t wait to plan the next one, not this time. I still don’t know what’s next and I am completely happy with that. Month of training, long days and 3 big days of racing had come to an end. Unfortunately, Merissa and the kids were back in America, so I missed their smiling faces and I guess I am waiting to celebrate with them too. I couldn’t have done this without the support of my amazing family. Merissa has been working double time both at home and in the office.